. FSW utilizes friction between the welding tool and material to heat (but not melt), soften, and “stir” material across the joint to produce a solid-state weld. Concurrent Technologies Corporation (CTC) has repeatedly proven the superior performance and cost effectiveness of FSW relative to other conventional welding solutions. FSW circumvents or minimizes many arc welding difficulties. 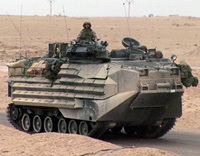 CTC has experience developing FSW processes and equipment for ground vehicle structures, trailer beds, ship deck structures, and more. 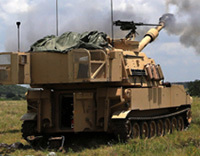 FSW technology can also be used in the aerospace, automotive, robotic, and other industries. 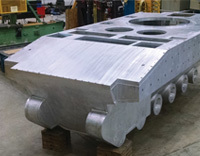 This large FSW machine is ideal for process development, prototyping, and fabrication of large structures. We can create the necessary plate size from standard mill run stock plates and seam together large plates such as these three 4' x 12' plates. 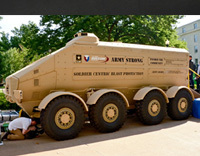 CTC developed a transportable FSW machine to be used on the Littoral Combat Ship (LCS) program. CTC’s team designed and produced the machine leveraging fixed geometry welding tool technology. 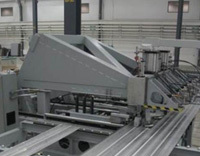 The machine's functionality and quality were proven through the production and testing of numerous representative panels and joints. 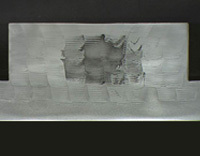 CTC developed FSW thick layer techniques to additive manufacture (AM) complex multi-alloy structural components. 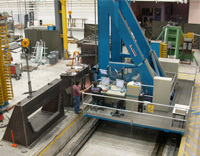 FSW-AM blended dissimilar alloys create the ability to embed high strength alloys into structural components and engineer the load paths with the desired alloy characteristics. 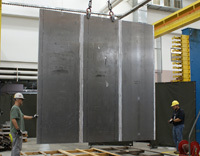 With this technique, CTC leverages innovative designs to make lightweight but stronger structures compared to traditional designs. Concurrent Technologies Corporation is an all-encompassing service provider for Friction Stir Welding solutions. Our experts have more than 30 years’ experience in solving metalworking issues, including metallic materials characterization and testing, as well as building prototype and production hulls and subsections. In addition, we have one of the largest FSW machines in the world. Concurrent Technologies Corporation’s quality management system is certified to the ISO 9001:2008 (Quality) and 14001:2004 (Environmental) standards. Its for-profit affiliate, Enterprise Ventures Corporation (EVC), is certified to the AS9100 standard for aerospace activities. Contact us for your Friction Stir Welding solutions.